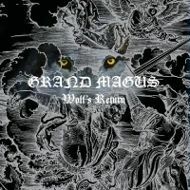 Draped in doom and powered by classic heavy metal, Stockholm's GRAND MAGUS continue the quality streak with "Wolf's Return", the band's third release. A majestic and soulful album, yet heavy metal in the truest sense of the term. I can always tell when an album has had a big impact on me, as I'll being doing something completely unrelated to music (not even listening to it) and realize that certain vocal lines or choruses are bouncing around in my head. "Nine", "Blood Oath", and "Repay in Kind" have been sneaking up on me all week, and suddenly I get the urge to play the album. The vocal melodies are wonderfully addictive. With its slow to mid-tempo pace, the mid-range vocals on "Nine" flow with enveloping melody and might, JB knowing exactly how long to hold a note before letting go. We've only just scratched the surface though. "Kingslayer" is the perfect album opener, a slamming up-tempo rocker, metal to the bone and — you guessed it — catchy as hell. I'm amazed at how the band packs so much into each tune without ever losing the listener in excess. "Blood Oath" is an example of GRAND MAGUS's knack for maintaining groove while keeping you engrossed in an alluring composition. An up-tempo rhythm and chugging riff downshifts into an infectious first chorus, changing up on the next chorus, but this time maintaining pace. The tune ends with a traditional doom plod. The title track, another shining example of heavy metal power laced with sorrowful melody, hits with a mid-tempo rolling groove, switches to a doom riff, hits sharply with a guitar harmony, shifts back to doom, then comes back around to mid-tempo groove. The entire time JB's vocals give one the multi-level feeling of dread and passionate. "Ashes" and "Light Hater" mix doom-laden atmosphere with powerful song craft. Moments of metal grandeur on both tracks brought to mind the majesty of vintage Ronnie James Dio, his RAINBOW period in particular. A term like "dynamic" simply doesn't do these songs justice. Finally, three interludes and an outro ("Blodörn", "Järnbörd", "Hämnd", and "Wolf's Return Part II", respectively) are just as essential to the album's cohesion as the proper songs. The disc would not be complete without them. No matter how you may have applied the term "doom" to the debut album or "Monument", all you really need to know is that "Wolf's Return" is a heavy metal album with captivating melodies that happens to contain a substantial doom influence. The results are impressive.